-Alligator foot holding a silver dime and saffafras chip, held together by red string, for luck, attracting money, and making it go farther. Fixed in a green flannel (or if I can get it, alligator skin) bag with an alligator icon sewn onto the bag (if I go with the flannel). The idea was to blend a bit of shamanism with the traditional hoodoo. I want this mojo to make me the "papa gator" of the swamp, to take on his qualities. I designed it ti bring luck, money, power, protection strength, and the instincts and intuition of an alligator! No attack, magical or mundane, will pierce my hide. Well, how a salesman would say it anyway, but you get the idea. Thoughts? I might add some Master Root and Sampson Root for mastery and control. Solomon Seal Root is great for wisdom and good at protection but I would add something else for protection as well--maybe something that both protects and brings good luck in gambling since that seems to be something this mojo is working on. I always like five-finger grass to bless everything that your five fingers can do. If you are working with clients then Boldo Leaf is good for protection, warding off evil curses, and keeping bad clients from darkening your door. The gambling luck is there for games of chance, but the alligator pieces are also to tie the spirit of the alligator to the mojo. The reason I call it "the Big Papa Gator," is because it is make me the "big papa gator" of the swamp. The biggest alligator in the swamp is untouchable, rules the swamp, has no natural enemies, and lives a long life and easy life. That is the objective of this mojo. Master root would fit quite well, as would five-finger grass. Anybody else? I don't think there is enough of a love luck in your mojo. I don't consider star anise effective as the only love herb. I suppose a love herb would not work with this mojo, since everything is about control and luck. I agree with the adding of five finger grass and I would go to thirteen items, instead of just seven. Well, I didn't add any love herbs or roots because I'm fine in that department. I having a loving girlfriend and I already plan to put a few things around the house to keep it peaceful. I would just prefer to rely on myself in love. Making it 13 items is a good idea, and I think I'm going to take you up on it. To find herbs, roots, and minerals that are employed both gambling luck or general luck and also to promote love-luck, you can consult the lists of herbs-for-conditions in the final 8 pages of "Hoodoo Herb and Root Magic." A quick comparison of the contents of those columns will produce many possibilities. To answer your specific question, no, the multi-usage curios are not necessarily "fiery" (spicy or hot) ones. Sometimes they have more than one use because of cross-cultural blending. What about feeding with Double Luck perfume? One possible way to increase the lesser aspects of money and love. 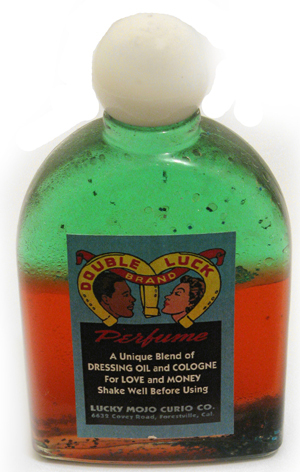 Dressing with Double Luck Perfume Oil sounds good. It is used by gamblers as well as those in search of love. In the old days it was sometimes indicated for inter-racial love affairs. Double Luck Perfume Oil, 4 oz. For other items to add I would suggest a human finger bone, a lodestone,and magnetic sand. When I fix an item to go into a bag I pray over it as I apply the oil. On the matter of feeding the lodestone i asked the same question a while ago and I was advised to remake the bag once a year, at that time wash the lodestone with whiskey, thank it for its work and feed it new magnetic sand. I would feed the hand it self either whiskey or a combination of whiskey and oils. I am attempting to make me a gambling mojo bag and I am looking for input. So far I thought of putting the herbs yellowdock, chamomile, marigold, buckeye, and sassafras in it. Along with a bat's heart, fast luck powder, black cat bone, van van powder, whole nutmeg, gold +silver magnetic sand, green lodestone fig. 14 seal and seal of mercury and jupiter, mandrake root , a blood stone and a tiger eye stone. I would like to get something to put in it that would ward off jealousy and envy from people who does not like to see me win also but need a good idea from someone. Also I was wondering is this too much or not. I just want a super super jackpot mojo bag that will also repel negativity. Any ideas would be greatly appreciated. I love to go to bingo and the casino.Also I do know that their are some people who hate to see me win. I have good days and a lot of bad ones. People love to come up to me and touch me all the time and that drives me crazy. No matter how many times I try to move out of their way someone always manages to touch me. So I figured a lucky gambling mojo /protection bag would help me hit the jackpot often. I see some people doing it all the time (all the time) and I want to e one of those persons. If possible, go to the casino when there are not a lot of people there, such as early morning, so people will leave you alone. You can't always avoid them, especially if they're drinking. Call security if someone is really being a nuisance. Keep your winnings to yourself, unless you're married and you have to report it on your taxes. It's nobody's business that you even like to gamble. Resist the temptation to talk about it with friends, family and co-workers. Include a personal concern in your mojo bag and make sure to feed it frequently with a luck oil, whiskey, or Hoyt's cologne. I don't know if i am doing this right, but i need to know what to do to make a money drawing bag.? Since this is your first post, welcome to the forum galaxsee! I like to recommend that new forum members read cat's online book about the history of hoodoo before attempting any time of spell work. It is an introduction into African American Rootwork (http://www.luckymojo.com/hoodoo.html) and includes instruction on how to make mojos. Personally, I would just buy a money drawing bag from lucky mojo because you know it is going to be done right, blessed, and will come with the oil you will need. The gamblers luck is a good link, and Miss Robin's spell definitely worked. I had a client try it and she definitely won quite a few times at the casino. what is mrs. robins spell? Hi I just had a few questions to ask and would really be appreciative if anyone out there has any answers..I recently used both LM Good Luck & Money Drawing oils/combined to give me an edge since i was heading out to play at a local casino..I rubbed both oils on my palms,finger tips,even on the back of my neck..I spoke out to my self,"Bring Me Luck/Bring me money"..I ended up not winning athing and the funny thing was that my mother that was playing next to me on the slots games won or did very well almost all night..Did i do anything wrong or rubbed the oils at the right or wrong places or were they the wrong kind of oils to use to play at a casino?..Any answers or help will be greatly appreciated..Thanks! I would have personally gone with one of the oils formulated specifically for gambling purposes if I was going to a casino - Lucky 13, Black Cat, Lady Luck, etc. I also would have had a dressed candle working for me back at my home, so I would have that heat working for me while I was playing. Of course many gamblers like to have an actual mojo working for them, and have that on their body while they play. Wearing oils can be effective for some people in some situations, but it's good practice to hit things from different angles to get the best result. You cannot expect to win every time you play; that's why they call it gambling. I agree with Devi that when you gamble you should use products that are specifically for gambling such as the ones she mentioned. It is also possible that your luck somehow transferred to your mom or it was her turn to win, not yours. It's also better if you approach a trip to the casino in a light-hearted manner, only spending disposable income. Set a budget and stick to it. LOL - Amen to that, Mama Micki! Thank u sooo much to all who responded and i will use ur great advice the next time..having this forum is such a helpful place and i am greatful..Thanks again! I have been using mojo bags for about 4 years and they give me luck with winning prizes such as concert tickets and some other prizes and I win about every month and I am thankful for that but I don't kow how to work the bag specifically towards winning money such as; Lottery or Bingo. I would like to know what am I doing wrong and how to correct this? You didn't mention which bag you are using. 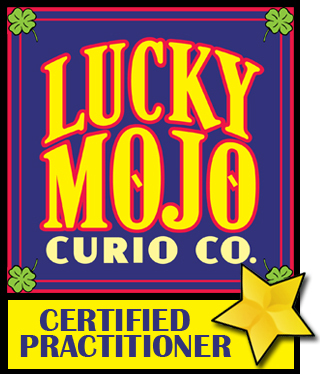 Lucky Mojo has several products designed to win the Lottery and Bingo. Read through this list (http://www.luckymojo.com/gamblersluck.html) By the way sometimes an extra step or additional conjure is needed such as Road Opener or adding additional conjure, baths, sachet powders, oils, and incenses. Have you considered these additives? I have a triple good luck bag and also a regular strength bag. I didn't think about using any road opening products. I win many things but no money. What road opening products do you suggest? I also did not see any mojo bags specifically for winning money. I pray over my mojo bag, for winning the lottery and also for bingo. are you entering lotteries? Why not try a Casino? I am new to the forum, this being my first post. I have been setting lights for myself and family since reading about the practice on luckymojo.com several years ago. I have been regularly setting lights for my mother who is a video poker player, using green 7 day candles, dressed in money drawing oil or van van, with pyrite grit and lodestone, magnetic sand, and five finger grass and/or comfrey. The last candle I set for her burned cleanly and beautifully, leaving the lodestone and piece of pyrite grit exposed at the bottom of the glass. I am feeling like I should use these two minerals and create a mojo bag for her. Is this a wise idea? I am assuming that since these minerals have been used in ritual, they are charged with magical energy specifically intended around drawing luck and money towards my mom, and that they will continue their work in a green mojo bag for the same purpose. I also have a lucky hand root here, some $2 bills, a Mercury dime, five finger grass and comfrey to work with in creating the mojo bag. Am I on the right track here? Any feedback is much appreciated! Also, what does one do with the candle glass set for someone else? Is this a crossroads disposal situation? Blessing to you Anthony! ...your money drawing curios can be used to create a mojo for Money drawing. I have used lodestone's left from candle work and in oils to further my work. Good Luck! FYI, I am posting information about Lodestones & Pyrite and their use in hoodoo magic and the forums discussion on the topics. Please recycle glass vigil candles after they are done or use them as a vase. Thanks for the replies. I have been recycling my used glass candle jars, and will continue to do so. THANKS!! Exactly, I apologize for not mentioning that, thanks Mama Micki. Good thinking EnergyLightMagic! I do similar things all the time. I spoke with my mom this morning, and got full confirmation that the candle I lit for her is working. She recounted the story of mysteriously waking up at 5:55am, only to be called later by my Aunt Vickie who was on her way to the casino and suggested my mom come along. She did go along and it was a very successful trip to the casino. Based on your thoughtful responses, and this awesome confirmation, I will definitely be using these minerals in a mojo bag to keep the ball rolling and the luck flowing! brown paper sack turn into a piece that you can write on. Get the middle of the sack not the bottom or top. Now on your altar, carve the white candle with "attract to me Money, and Good Luck." Now dress it with attraction oil. Now with the yellow candle you carve "I will have money, power, bravery and nature." Now dress with High John oil. Now dress the green candle carve dollars signs on the candle seven times and dress it with both Attraction and High John oil. On all three candles carve your full name 7 times and then place all three candles in a triangle shape. Now get the attraction incense and light the first incense and say, "May the attraction spirits be with me," and then light all three candles. Now grab the five finger grass and with each hand place a nice piece in the red mojo and and say "I will have success in all the things that five fingers can do," now read Psalm 23. Next place the lucky hand root in the middle of the triangle and add 3 drops of attraction oil to it and say "My Lucky Hand, may all the good luck and money be grabbed". Read the 23 psalm again and rub the lucky hand root towards you and place in the bag. Do the same with the alligator foot. Place it in the middle of the triangle and dress it with 3 drops of attraction oi, but say "Money will be grabbed". Now place the rattlesnake rattle in the triangle and add 3 drops of high john oil and say "Good luck and bravery will come to me" and read psalm 23 and place in the bag. Now get the High John root and place it in the triangle. Add 3 drops of High John oil and rub it towards you and say "May power, nature good luck and plenty of money come to me." Leave it in the triangle while you read the 23 Psalm. Now get the brown paper sack and write you wish that you want this bag to do. Like say "Attract Good luck and plenty of money through gambling". Anoint the 4 corners with both Attraction oil and High John oil and place your personal item and High John root in the middle of the paper and fold towards you while you say your wish. Place in the bag, then read the 23 Psalm. Now breathe in it and tie it up and light the second amount of attraction insence and smoke the bag in it. Place the bag into the middle of the triangle, add 7 drops of High John oil and read the 23 Psalm. Focus on your bag and what you need it to do for you; talk to it until the candles burn out. When the candles burn out, now you have a very strong mojo. Now you can win in dice, cards, lottery or any games of chances your five fingers can do. Now get the remains from the candles and incense and wrap them in green cloth and bury in your back yard. Thank you very much for this detailed and highly powerful mojo. It is much appreciated. What i particularly appreciate about your post is that you tell people how to focus, what to carve on the candles, and what Psalm to pray. This spiritual aspect of the work is what sets your powerful hand apart from the poorly made ones, and it instructs people in how the work is really done. I am placing this in the Gambling Luck section of the forum and making it a "sticky" post, which means it will always stay on the first page and cannot be driven down to the next page by future posts. Not bad for a first post at all! Thanks for sharing sir_lucky! Thanks for this detailed description of your methods. I'll be watching for future posts from you. Welcome to the board! Thank you sir_lucky for sharing I will definitely try it. I purchased a triple strength good luck mojo bag last year and it worked about 2 times letting me win big prizes and i won 3 prizes at one time last year, but after that, I didn't win anything with it. It just went cold on me. Would triple strength mean the amount of prizes that you win or would it mean more strength in power in the bag? Triple strength refers to the number of curios in the bag, hence adding more power to it. Have you been feeding the mojo regularly? Talking to it? Keeping it out of the sight of people? Mojos are alive and need that kind of care. If you feel the bag no longer works for you, I suggest you bury it in the ground and order another one. I have a gambling good luck mojo bag and it helps me to win concert tickets, but I cannot win any money from games of chance. I play the lottery and also do the scratch off games and i never win anything. I would like to know what to do and find out why it is not working. I anoint my bag once a week and talk to it and pray. It works well with winnng the concert tickets and i am thankful, but i do need money. Gambling should be entertainment, not depended on as income. If you need money, I suggest Money Drawing, Wealthy Way, Steady Work, and Prosperity supplies. As the subject says, I am going to Vegas next week with my sister (thank you again for the turn around in my life!) Unfortunately, I will be unable to do Ms Robin's Lucky Gambling Spell since I can't order the items for it for them to arrive in time. What I have that could help so far are: Money Drawing Incense, Money Drawing Oil, Fast Luck Oil, Fast Luck Incense and Attraction Bath Crystals. I also have Crown of Success Oil, Cleo May Oil and Cleo May Bath Crystals since Vegas is a great place for men to spend money on women. I already have a Money Drawing candle being burned for me by MISC, what candle(s) should I have done specifically for the trip? I play craps 90% of the time and slots 10% (when I gamble, that is, lol) if that needs to be taken into consideration. I'm thinking Lady Luck candle with the dates we will be there and a specific amount in the petition possibly coupled with a Lucky Hand candle with the same information? I forgot. I have Come to Me, Commanding and Compelling oils, too. I mention these because in the Gambling section I read about someone using Come to Me to help them win. Lady Luck or Black Cat would be a good choice in MISC-set Vigils (or both!) You've also got good products to work with. Some money-drawing & Attraction or Come To Me would combine well with the Crown of Success to wear when you gamble. A whole nutmeg kept as a pocket piece & oiled with the combo would also be a nice choice. I've also merged ur post into a thread you may find some ideas in. Blessings and fine winnings to you! Thank you so much, aura! I hadn't even thought of Black Cat and when I looked at the description, it was perfect because I play craps! I am in the process of making a gambling mojo bag for myself and wanted to do one for my parents. They both love to gamble and sometimes they have a great week and sometimes they have a bad few weeks! I have recently purchased gambling supplies from LM. I usually do my work only for me, but now that I have been doing it for a few years I want to do some work to help my family be more financially stable. I have developed a great relationship with the planets and use them in all my work. So I will incorporate them, I also use the psalms alot and do most of my work with candles, but just need some advice on how to do the other part for my parents. Should I start with a cleansing then road opening and then the gambling? They don't know what I do and can never find out, so it has to be done in secret. Any help is greatly appreciated. Thank you high john, all my angles, spirits, saints and entities who are always with me. You are absolutely correct in your game plan! Although your plan is GREAT and there's nothing wrong with it, I would FIRST start with a blockbuster followed by your strategy. Wishing your parents Wealth and success!! Thanks! I will purchase that kit asap!